I have been promising myself that I would buy a proper pillar drill to replace my Record Power drill stand for some time now and having reviewed the specifications of a number of models online and in catalogues, I decided that the best value for money seemed to be the Axminster WD16F. As I was in the North West recently I decided to make a slight detour and call in to the Axminster Warrington store and compare the WD16F to one of the other contenders, the Jet JDP17F. It just so happened they were having a 10% off one item promotion so it turned out to be a good day to call. First of all I have to say thanks to the chaps at Axminster Warrington; the assistant who served me was extremely helpful. The machine I wanted to see was not on display, but he pointed me in the direction of the WD16B they had on show which is essentially the same machine with a shorter column for bench mounting. Meanwhile he went to check that the one item recorded as being in stock was actually in their warehouse and lent me a tape measure to check that the package would fit in the back of my Freelander. The guys in the warehouse were equally helpful when it came to loading. At 88kg I could have done with one of them to help me at the other end, but my next door neighbour saved the day and with his assistance it was safely unloaded. The other machines on my short list were the Jet JDP17F and the Record Power RD58P, both of which offer more motor power and speeds than the Axminster WD16F and the Jet an extra 5mm of chuck travel, but both cost at least Â£100 more than the Axminster machine. I had looked at the Record in Snainton Woodworkingâ€™s showroom and it seemed a robust machine and much better built than the other cheaper machines on display there or the Clarke machines offered by Machine Mart, which I had also looked at. The build quality of the Jet which was on display at Warrington also seemed excellent and whilst I feel either of these machines would have served my purposes, I did not have the need of the extra power or speeds and could not justify an extra Â£100 for the sake of 5mm of chuck travel. Neither the Record nor Jet machines seemed to me to be superior in terms of the build quality to the Axminster machine. Assembly was straightforward following the clear instructions and I was able to construct the machine single handed by lying the drilling head on the floor, installing the pillar and then lifting the machine upright. Adjusting the chamfered ring collar that holds the rise and fall rack in place so that the rack rotates but does not rattle was a bit of a performance but once locked in place it all works nicely. 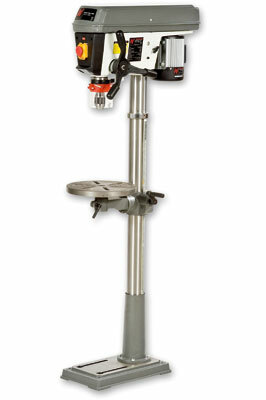 As this machine is primarily designed for woodworkers the circular drill table is flat underneath which is great for clamping work in place and is slotted for a drill vice or cross vice. 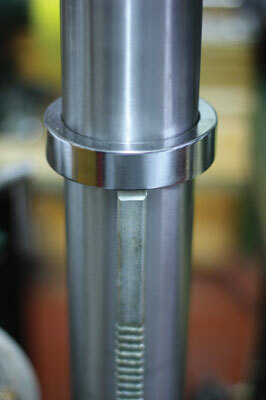 With my cross vice bolted in place drilling small items like pen blanks is achieved easily and accurately. There is no discernible play in the quill and chuck and the run out, measured with a dial gauge, is insignificant for the purposes of which the machine was designed. I have two minor niggles: first the release screw for the pulley and drive belt cover is a 5mm machine screw with a pozidrive head which means a screwdriver is needed every time you want to change speed and there is every chance the screw will get lost in the shavings even in my tidy workshop. I resolved this by drilling and tapping the retaining clip to 6mm to take a knurled machine screw I had lying about the workshop. Never throw anything away, you never know when you might need it! 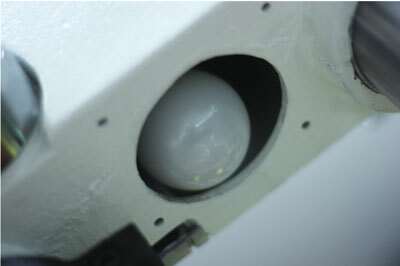 My second niggle was the light bulb supplied for the machine light which was a fairly nasty looking Chinese low energy bulb which protruded below the casing and blinded me whenever I looked at the machine from anywhere in the workshop. I replaced it with a globe shaped low energy bulb of similar wattage which not only fits into the casing but also provides a better light. The only other minor point is that the springs on the chuck guard are rather stronger than is strictly necessary and if you accidentally let go of the guard it springs back into place at such a velocity and with such an impact that is likely to result in breakage of the plastic. That said, the chuck guard on the Jet seemed similarly disposed towards self-destruction. 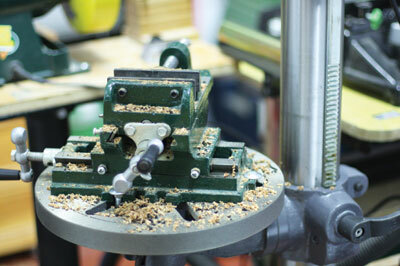 In use the machine makes light work of drilling in mild steel and wood, and at the slowest speed is easily capable of drilling through a hard piece of oak (Quercus robur) flooring with a 50mm Forstner bit. The rise and fall mechanism operates smoothly and the induction motor is nice and quiet. As with almost all machines of this type there is some drumming from the drive belt cover but not so much that I feel the need to do anything about it. 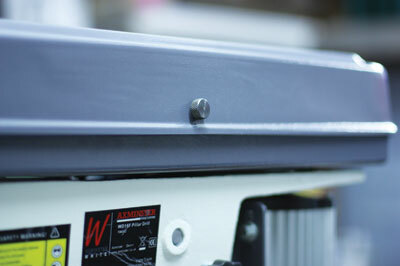 Bearing in mind that I intend to use the machine for woodworking and occasional light metalworking and not for precision or heavy engineering, I am impressed with the performance and build quality for the price.